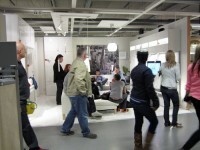 IKEA, Manchester and Beijing, 2012 - 13. 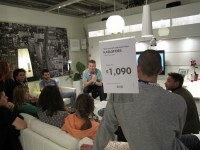 A series of events that utilized the spaces of IKEA for a series of symposia on the theme of Comfort Zones in Creative and Curatorial Practice. The first 3 installments of this project consisted of 2 day long meetings - set in an empty retail unit, in Ashton retail park beside Manchester's IKEA store, that I had been granted free use of until the owner was able to lease it again - centering around the symposim in IKEA. 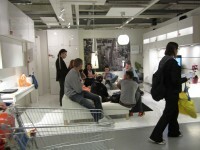 A number of participants were selected from an open call to spend 2 days using the retail unit as a reflective space for discussion and sleep, while contributors have been invited to speak or perform in IKEA. The framework is evolving and there are overlaps between those 'participating' and those 'contributing'. The final event took place in Beijing's IKEA in 2013, as part of my residency with the Inside Out Art Museum. Contributors have included Andrea Francke, Dave Beech, David Osbaldeston, Homeshop, Jack Mcconville, James Hutchinson and Jonathan Dronsfield. For an archive of documentation, research and events visit here.